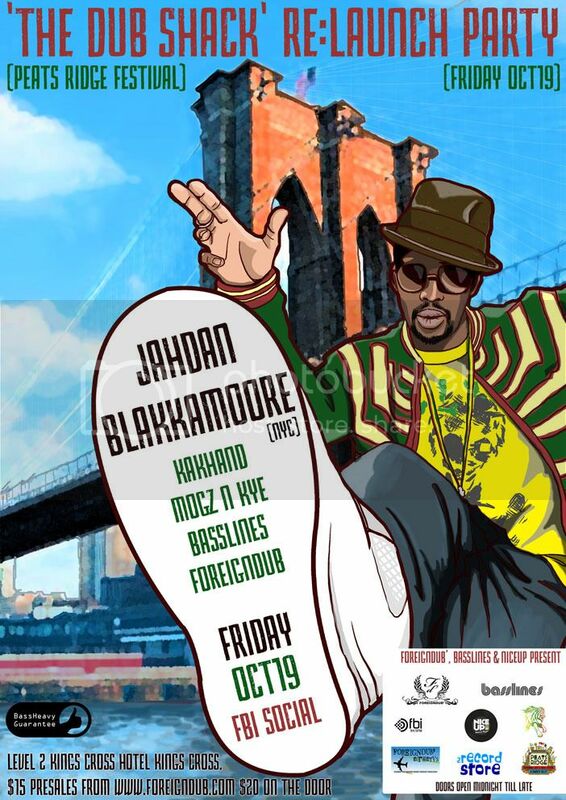 Jahdan Blakkamoore direct from Brooklyn for his first ever Australian Tour. Jahdan Blakkamoore emigrated from Guyana to Brooklyn at age eight. He grew up on reggae imports and has long made a name for himself as a gifted and inspiring Reggae/Dancehall/Hip Hop/Dubstep artist – the world over. His music has been described as “Urban World Music with a message.” Jahdan’s sense of melody, superb song writing skills and ability to effortlessly cross over genres has solidified his status as a relevant artist in the music industry. As lead singer of his group Noble Society, they received Best Reggae Album of the year on iTunes for ‘Take Charge’ in 2008 and he has not stopped to win over worldwide audiences since. His solo debut album ‘Buzzrock Warrior’, released worldwide in 2009 on the Gold Dust/!K7 label, was also voted Best Reggae album of the year on iTunes. His solo debut was long awaited by his large fan base spanning from Brooklyn to Oslo, built over many years of delivering command performances and recordings throughout the US and Europe. His current solo album ‘Babylon Nightmare’ released December 7th 2010 on the Lustre Kings label. The track “All Comes Back to One” was the first video and single from the album which received positive reviews globally. Jahdan is featured on the track “Cash Flow” from Diplo and Switch’s Major Lazer collaboration. He also wrote the song "Struggla" featured on Matisyahu’s new album. His verse on the hook of Smiff N Wesson’s classic, “Sound Bwoy Buriell” is still played regularly in clubs and on radio throwback sets around the world. Jahdan has shared the stage with great artist such as Anthony B, Sizzla, Lee “Scratch” Perry, and many others and now steps onto Australian soil for the very first time to share the positive perspective of his music. He says, ‘People can expect a very exciting and rhythmic show where the vibes change from reggae to dubstep to dancehall within minutes of the show starting…the audience will get special treats and throwbacks from my past songs that they might not have known I sang…it’s Blakkamoore so expect the unexpected! I cannot wait to perform for audiences in New Zealand and Australia’. brought to you by Foreigndub, Basslines, NiceUp & Peats Ridge Festival. It is with great regret that we have to announce that Jahdan Blakkamoore will not be able to attend the launch party this friday at the fbi social due to personal matters, which also affects the tour to New Zealand. The show must go on and we still have some great artists perfoming on the night. We will now slash the entry fee to FREE entry from midnight till late. niceness on the dancefloor! All presale tickets will be refunded this week.